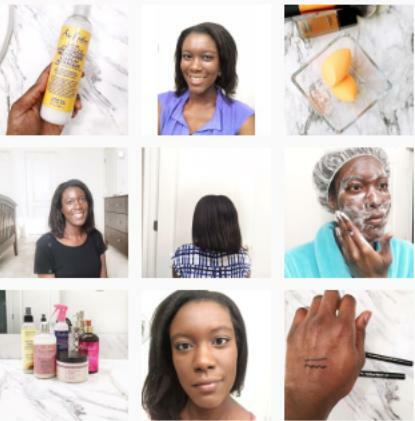 When I started my relaxed hair journey almost two years ago I did lots of searches online and found several articles and videos from relaxed and natural hair bloggers about protective styling. The articles and videos would detail how protective styling helped to protect their relaxed or natural hair from dryness and breakage. Some would also talk about how protective styling would help them retain length and keep their ends healthy. After seeing these articles and videos I was sold on protective styling and took it seriously. This resulted in me deciding to wear short-term protective styles about five to size days a week. 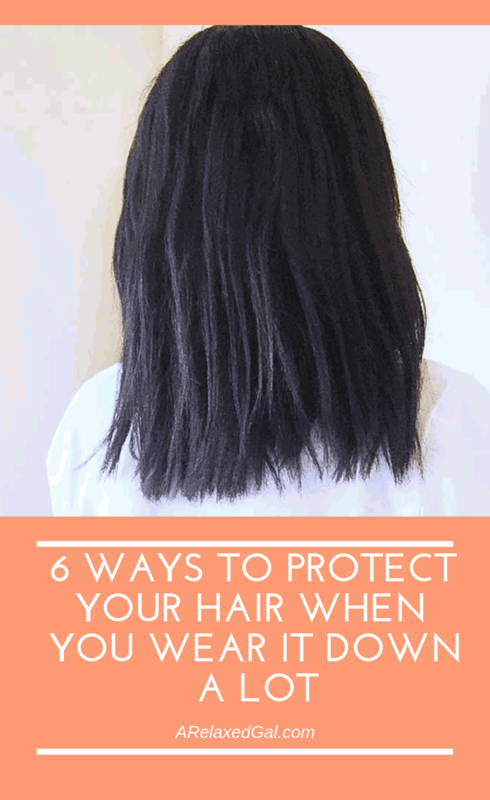 Then about once or twice a week I would wear my hair down to give it a rest from any tension it could be experiencing from being pulled back. So I've been wearing short-term protective styles such as buns, tucked under braids and ponytails for the majority of my hair journey so far. I have to admit that following my schedule of short-term protective styling at least five days a week has paid off. I've been able to retain length between each of my relaxer touch-ups and reduce dryness in my ends resulting in longer strands and fuller ends. Now that I've seen how good my relaxed hair looks from short-term protective styling, I've decided to enjoy my hair for a while by wearing my hair out more. Lately, I've been wearing my hair out about 3-5 days each week versus the 1-2 days I had been doing. To do this I've been using hair claws and clips to put up my ends up during trips to and from work, church, the store, etc. By clipping up my ends they aren't brushing against my clothes all day, just for a portion of the day, which could damage them. When I'm home I keep my relaxed hair up either wrapped in a satin scarf or up in a satin cap. This is another way I'm keeping my relaxed ends from being damaged by brushing against my clothes all day. Surprisingly my ends have stayed moisturized though they've been out more, sometimes they need a little moisture boost. So I apply some leave-in conditioner to my every couple of days or when they start to feel dry. I like to do this at night as the leave-in conditioner has some time to really coat and moisturize the strands and I wake up with moisturized hair. I've tried to reserve my protective style for days when the weather is cold or wet. Also for when my relaxed hair is starting to feel really dry. 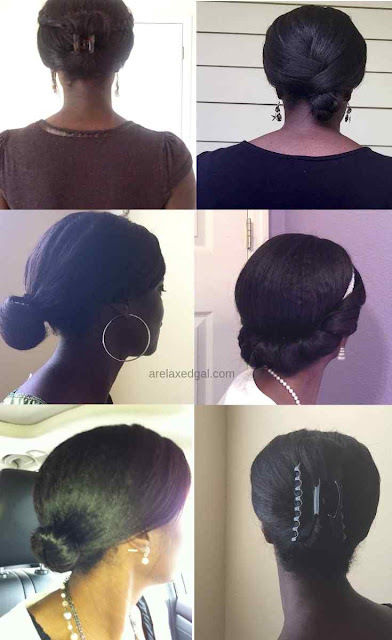 This style is usually a tucked under braid, a bun held up with a hair tie or hairpin, or I use a hair clip. Though I've been wearing my hair down I've stayed away from the flat iron and curling iron to avoid causing any damage from using direct heat. I also don't use hot air when drying with my blow dryer. Instead, I use the cool setting. And no matter what type of heat I'm using my hair I'm using a heat protectant on my hair. The shampoos and conditioners I've been using during my wash days are moisture focused which help to keep my strands supple. I also make sure to deep condition each wash day for at least 30 minutes with a focus on my ends. How do you protect your hair when you wear it out a lot? I love to twist my hair and keep it up once a week. I love your routine. Thats a great list. I use most of them especially when i'm home I just don't want to fuss with my hair. I make sure to avoid using heat as much as possible and wear it in a pineapple pony for bed!